I am always on the lookout for new digital storytelling resources. There are so many different options out there. 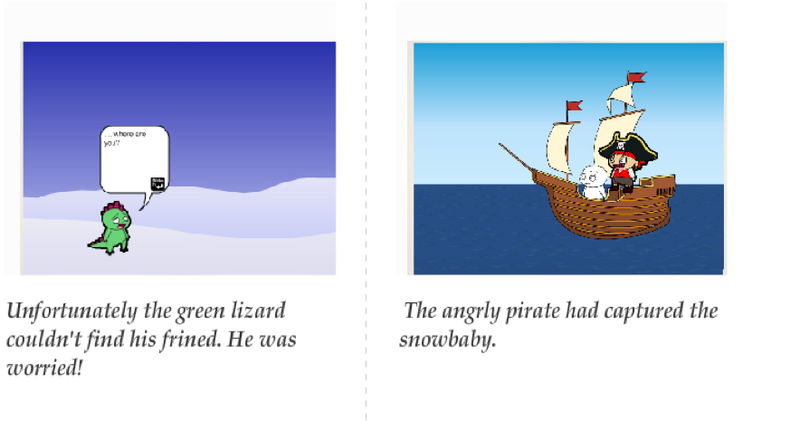 Two web applications that we use are Kerpoof with our younger students to create storybooks and ToonDoo with the older students to create cartoon strips. Today I came across StoryMaker while perusing my Diigo notifications. It may not be new but it is one I have not seen before. It is certainly fun to use, with its predetermined drag and drop characters, scenes and props. Dialogue as well as a written story are both possible. The final product can be printed off or downloaded as a pdf. 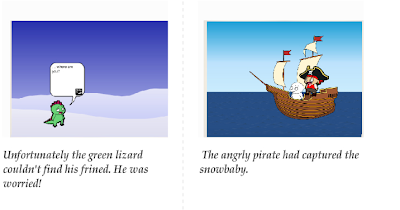 Unfortunately I couldn't find embed code for the storybook, which would have made it a real contender for the work we do with the younger students. One way around this would be to upload it to Google docs or scribd to generate the appropriate code. On a positive note, an account is not required to use the application and download books, making it an easy tool to use with any class. Here are a couple of pages from my first book.